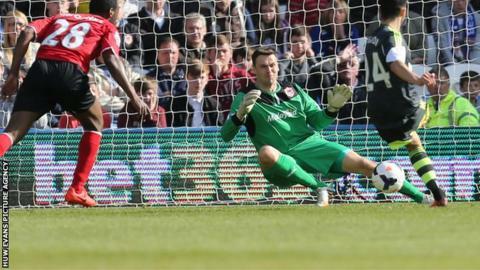 Goalkeeper David Marshall says Cardiff City are capable of reaching 36 points and sealing Premier League survival. Their 1-1 draw at home to Stoke City saw the Bluebirds go up a place to 18th, two points behind Norwich City. Cardiff, who currently have 30 points, travel to Sunderland on Saturday before their remaining games against Newcastle (away) and Chelsea (home). "We are more than capable of doing that [36 points] with the last two performances," insisted Marshall. "Last week [the 1-0 victory at Southampton] picked us up because we were struggling. "Picking up points on the road has given us a lot of belief. "We have got two big games [against Sunderland and Newcastle] and the Chelsea match - the last of the season - is going to be difficult." Marshall's optimism backs up his manager Ole Gunnar Solskjaer's belief that the Bluebirds can avoid relegation back to the Championship. Cardiff are helped in their survival bid as 17th-placed Norwich face a tough run in. The Canaries play away games at Manchester United and Chelsea before ending their season with a home match against Arsenal. Marshall, 29, has won plenty of plaudits this season and the Scotland international currently leads the Premier League save list. And the goalkeeper, capped 11-times by Scotland, believes he will have to play a vital role in Cardiff's last three fixtures. "I'm happy to make saves, but I'm going to have to do that until the end of the season because there are games we are going to have to be chasing and trying to take chances to win games," he said. Marshall said he was happy with a point against Stoke City, especially after they went 1-0 behind. "We want to win our home games, but after going 1-0 down it's probably a point gained," he added. "It was a good performance. Stoke are a good team. They were in form."